Friday, November 18, 2016 was a glorious day for CHC! The sun was shining, the temperature was an amazing 72 degrees, and we had much to celebrate! It was wonderful to see so many family, friends, and supporters join us for the long awaited grand opening and ribbon cutting ceremony for our new inclusive playground. A special shout of gratitude to WGRZ, Channel 2 for sending a camera person out to capture some of the fun! 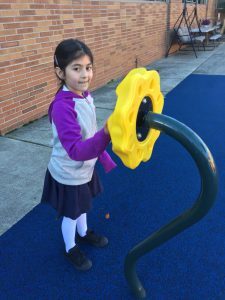 Thanks to a 3-year initiative undertaken by CHC Learning Center, and the help and support of many community members, students with differing abilities can now play safely in the out-of-doors while attending school. GAMETIME/PLAYCORE, TITAN, AND SPORT SURFACE SPECIALITIES helped us design and install this attractive playground where all children can play together. 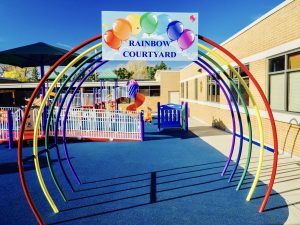 Complete with sound activated educational panels, electronic musical instruments, rain wheel, shadow play, rock-n-raft, GT Jams musical instruments, and much more, Rainbow Courtyard offers unique opportunities for all children to engage, interact, and have fun together! 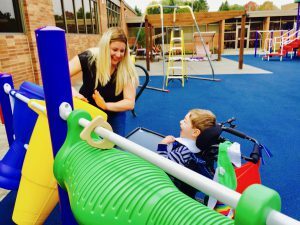 Our vision was to create a play environment with a smooth, poured in place protective rubber surface that allows easy access for individuals using a variety of mobility methods, along with innovative and interactive playground equipment that would allow all students to play together. We welcome anyone that would like to learn more about Rainbow Courtyard or visit in person to contact us for further details and or a tour: (716) 831-8422.